I was so enthralled with Judge Sand’s city of Yonkers case that I couldn’t help but do a little more research on him. And lo and behold, nary a page in from a google search, I found another case that deals with math! Henry Barschall, working for the American Physical Society and the American Institute of Physics, investigated the cost of science journal subscriptions for libraries. Even then in 1986 (as we hear is still the case now), science journals were increasing their prices — for a variety of reasons. And science journals were on average more expensive than journals in other disciplines (e.g. 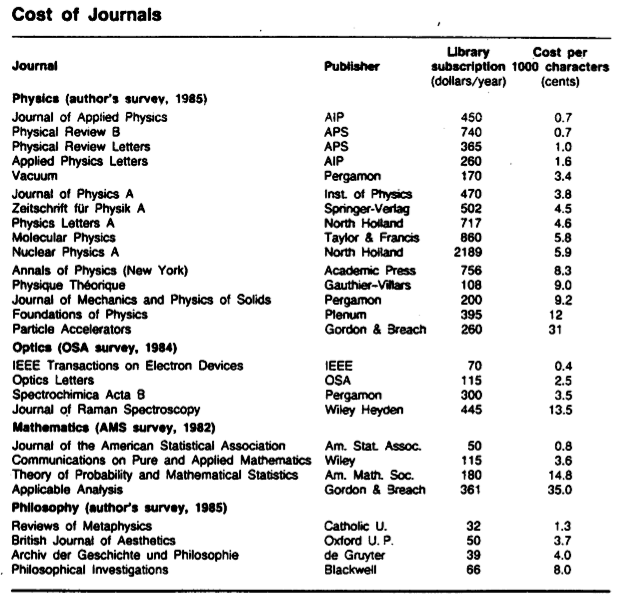 in 1985, the average yearly subscription for a science journal was $328, while for philosophy, it was only $47 — here). An expanded survey, published in 1988, took into account not only the price, but the “impact” (or importance) of the journal… The metric for the impact was the average number of papers which cited an article in the journal two years after its publication. The more “impact” the journal had, according to the study, the more it mitigated a higher cost (hence: a ratio was created). Again, APS and AIP were near the top of the list, while Gordon and Breach were way down at the bottom, with a cost/impact ratio more than twice the next publisher. This action, a dispute between publishers of scientific journals, raises an issue of first impression: whether a non-profit publisher may be sued for false advertising under the Lanham Act for publishing comparative surveys of scientific journals which, through the employment of a misleading rating system, rate its own publications as superior. These articles, G&B alleges, constituted the start of a “continuous promotional campaign” waged by AIP and APS against them with the aid of Barschall’s survey results. 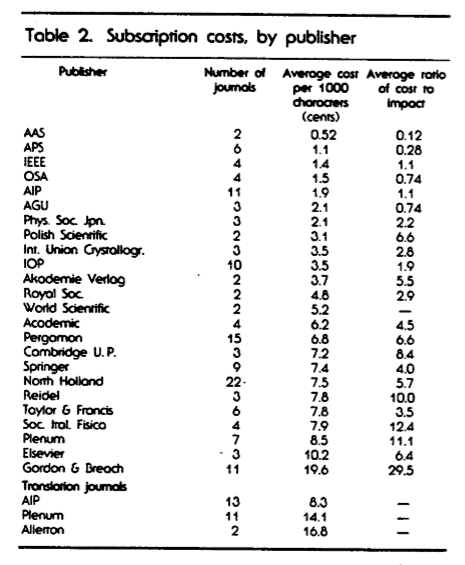 First, G&B alleges, AIP and APS distributed “preprints” of the 1988 survey results to librarians (the primary purchasers of scientific journals) at a conference in June 1988. Since that time, G&B alleges, defendants have continued to disseminate the results of Barschall’s surveys to prospective purchasers through press releases, letters to the editor, “electronic mailings,” and meetings with librarians (“secondary uses” of the articles). G&B states that its attempts to reach an accommodation with defendants have been fruitless, and that it has been forced to resort to the courts. After filing a series of legal actions in Europe claiming unfair competition, and failing to receive satisfaction in Swiss, German, and French courts, G&B brought this lawsuit in September 1993. G&B contends that the articles are promotional materials cloaked in the deceptive guise of “neutral” academic inquiry, and thus constitute misleading advertising under the Lanham Act, 15 U.S.C. § 1125(a), and comparable provisions of New York General Business Law. Barschall’s studies, G&B contends, far from being neutral, in fact constitute a “cynical promotional campaign” by AIP and APS to deceive librarians and other consumers of scientific journals into thinking that their journals have been “scientifically” proven to be of superior value. Judge Sand’s judicial opinions, the trial transcript (really interesting stuff! I swear! ), Barchall’s papers, and other related material have been put on this site at Stanford for you to read. Barschall’s methodology has been demonstrated to establish reliably precisely the proposition for which defendants cited it — that defendants’ physics journals, as measured by cost per character and by cost per character divided by impact factor, are substantially more cost-effective than those published by plaintiffs. Plaintiffs have proved only the unremarkable proposition that a librarian would be ill-advised to rely on Barschall’s study to the exclusion of all other considerations in making purchasing decisions. This consideration in no way makes Barschall’s study or defendants’ descriptions thereof false, and accordingly judgment is granted to defendants. And the case is over! Could this be useful in a math class? Before presenting the data, it could lead to a discussion of how one might measure the cost-effectiveness of journals, and different ways students could imagine calculating them. A baby project: students could go to the school library and get data about various online databases that the library subscribes to, and try to determine whether subscribing is cost-effective for the school. Or at least, the class could try to brainstorm out what sorts of data we would want (e.g. the cost of the database annually, whether — and if so, how quickly — the cost of the database has been increasing, the number of times the databases are accessed each day, the amount of information the databases contain, etc. )But honestly, this seems like it isn’t really worth it. It would make for an interesting independent study, though. Ideas for how one might present the data visually? Should a court (even with scientific experts being called in) be the final arbiter in whether a mathematical study/survey was sound or not? If not, who should be? But besides being interesting, do you see a good use for it in the classroom? If you do, leave a comment with an idea! Here is what I would do with it… I would mention that journals can be compared not only by the number of readers or subscribers, but also by how much value they give, for the price. Then I would invite people to devise their own metrics for comparing journals. I’d also invite them to pick their own topic for journals, relevant to their interests. A competitive project for each small group: to make up a metric that makes “their” journal most valuable among several chosen for the project. Depending on how advanced people are, the metrics can involve estimations and basically counting, or proportional reasoning, and then all the way to multi-variate analysis and statistics. The fact that some real-life drama happened around the topic adds value to whatever friendly drama one can create through projects. An interesting offspring: we could invite people to design metrics for comparing class activities ;-) The key is not to get either sued or lynched. It’s so scaffolded (“estimations and basically counting, or proportional reasoning, and then all the way to multi-variate analysis and statistics”) for different grade levels, but also would be good for students with different thinking styles within a grade level. As for metrics for comparing class activities — if students ran it, teachers would cringe. Mwa haha. It could turn into a teacher-sanctioned version of ratemyteacher.com. When you say the study was “sponsored” by and Henry Barschall was “working for” APS/AIP, that is misleading. Although APS suggested once that Henry Barschall research the costs of journals, they provided no money, reward, technique, or anything else that would influence the results. As the court proceedings suggest, Henry Barschall’s results were completely based on unbiased measurements. It was only the litigious tendencies of Gordon and Breach (from the “bottom” of the comparison list) that made this paper end up in court. G&B also brought lawsuits against Barschall and APS/AIP in dozens of countries around the world, and won nothing from them. And litigation doesn’t just cost money. When the case was settled in 1997, Henry Barschall was already dead. His death may not have been a direct result of the lawsuits, but he did have to spend time reviewing court documents while hooked up to a morphine drip for his cancer pain. The only “reward” for his study and the endless lawsuits were several acknowledgements and awards from librarians who were very grateful that someone (anyone) had quantified the process of having to weed out less-used journals from more-used journals, for purchase in their libraries with their very limited subscription budgets. There was a history of librarians actually being sued for canceling more-expensive journal subscriptions. Of course, I may be biased. Henry Barschall was my father.